Last weekend, I planned to hire a new release DVD. I hadn't done so in quite some time, and to my surprise, found that three DVD rental stores within a 10km radius, have since closed their doors to the public. What is left, is a very small Blockbuster rental store, which has reduced its store size by 1/4 over the last year. As technology advances at an incredible rate, this is no surprise. It appears most people are connected to the internet, and the majority of which now download movies in the comfort of their own homes, rather than drive to a nearby store to rent their required new release. The imminent death of the DVD rental store is foreseeable. But what happens if you are not so technologically advanced; not connected to the internet, do not have access to a speedy download, or perhaps (such as I) simply would not have the first clue on how to download a movie. What options are left, if DVD rental stores are becoming such a rarity? 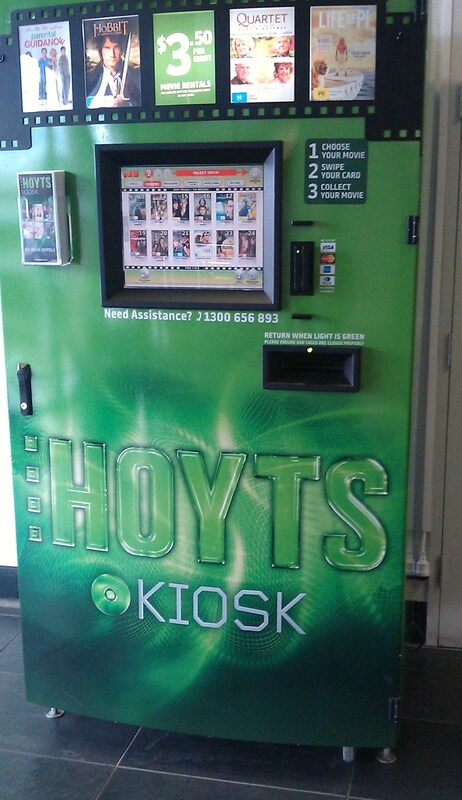 You may have seen Hoyts DVD rental booths popping up in shopping centres and supermarkets. Slot in your ATM card and the rental booth will pop out your required movie rental, just like a confectionery snack machine. On return, simply pop the DVD back into the machine, and you are done. Instant access to the latest DVD rentals. You can rent DVD's from your local library, completely free of charge. You are not limited to one DVD, usually you'll be able to hire quite a few at time and keep them for up to three weeks. Bear in mind you'll not have access to new releases at your local library, older movies, kids and TV shows, and documentaries are more commonly found. Unfortunately due to the volume of rental that each disc gets, quite often they'll become scratched, which can be a downside to local library DVD rentals. In addition to downloading movies online, there are also websites which offer DVD rental. Order your required movie online, and have it delivered straight to your letterbox. Once watched, post the disc back in a pre-paid envelope supplied by the company. Two popular websites offering this service are Quickflix and Ezyflix. The last option, would of course be to buy a new release DVD. The upside to this would be that you own the movie outright, without the need to return it, the downside being the purchase cost. I find the cheapest places to buy new release DVDs in retail outlets are BIG W, Target or K Mart. I also tend to find JB Hi Fi better value for older movies and TV shows available to buy on DVD. Have you embraced the download, or are you still renting or buying movies on DVD? I think there are also a number of options with places like Quick Flix to have movies streamed to you. Interesting topic. Hi. This is a great shame as my family and I enjoy going to our local civic DVD library, choosing a DVD, grabbing some pop corn or ice cream, and watching the film.The owners are really nice people and remember us so we have a little chat, , and I even like returning the DVD as I make it into a walk for exercise. Technology is useful, but shouldn't replace good old fashioned human interaction and sense of community. I've been hiring from Quickflix for the last couple of years and can't fault their service and value. I dislike having to drive to the DVD shop and trawl amongst all those ailses for something I might like to watch, so this is a much better option all around. I have access to dozens of movies I would not otherwise have heard of and can read others comments and feedback to help decide. The rental booths have a terrible range and the library's have DVD's in very scratched up conditions (At least the DVD/Video stores have the technology to repair most of them) Also nobody wants to purchase lots of movie they don't know if they like yet or not and going online isn't the same as being able to chat with the staff, who mostly know what they are talking about, who can recommend you good movies that you will actually like! LONG LIVE THE VIDEO STORES! These Hoyts booths are so convenient! I've used them a few times now! I moved over to Melbourne from Perth where there are still several dvd rental stores still around. Live in the cbd now and haven't seen any around, so thank you for your article.